This post was jointly authored by Austin Frakt and Aaron Carroll. By now most of the blogosphere has weighed in on Joe Lieberman’s idea of increasing Medicare eligibility from age 65 to 67 (see Frakt, Klein, Volsky, Drum, Krugman). Most of the focus has been on how the delayed eligibility will affect overall health costs. Though federal costs may go down, overall costs would not, because most would just be shifted to seniors themselves. Cost isn’t everything, though. There’s something else delay would do: harm health. This is not guesswork on our part; there’s clear evidence in the literature. In several papers, Michael McWilliams and colleagues found that utilization, spending, and outcomes for age-eligible Medicare beneficiaries differed for those who had been uninsured prior to turning 65 vs. those who had been insured. Their work was based on survey data, sometimes merged with Medicare claims. 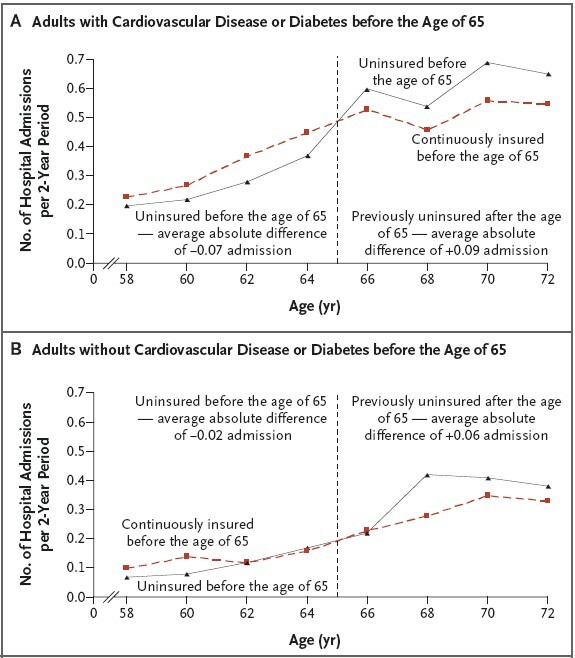 This is a relatively strong analytic approach since it exploits a discontinuity in coverage that potentially applies to nearly all individuals: the vast majority of the population enrolls in Medicare at age 65. The authors found that, relative to those with insurance before age 65, those without insurance prior to Medicare eligibility spent much more money on health care after they became Medicare eligible. In other words, people wait to get care until their Medicare kicks in. This is bad both for health and for the federal government’s bottom line. Delaying Medicare even longer would likely make this worse. People would forego care longer, health would suffer, and Medicare would pay for the consequences later. Here’s the evidence in charts, extracted from McWilliams et al.’s papers (references listed at the end). 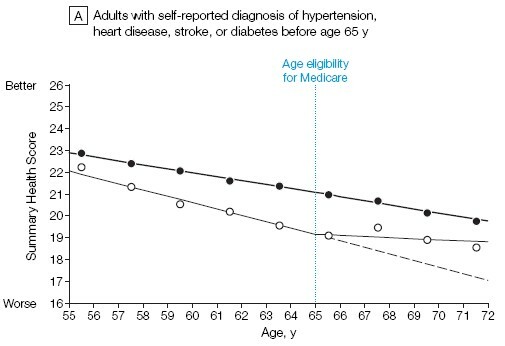 First, from , we see that after age 65, uninsured adults with (chart A) and without (chart B) hypertension, heart disease, stroke, or diabetes all have a significant and improved change in trend in health status after obtaining Medicare. Insured adults, however, do not experience a change in trend. 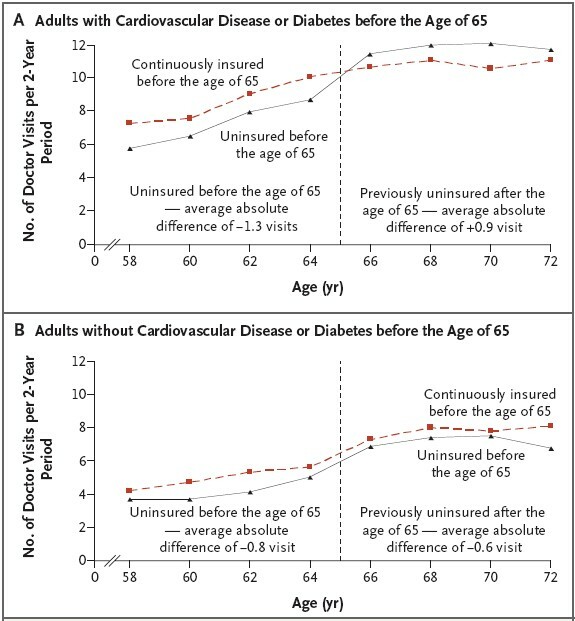 Medicare improved the health of the uninsured; delaying Medicare would delay that help. Next, from  we see a similar phenomenon in doctor visits. 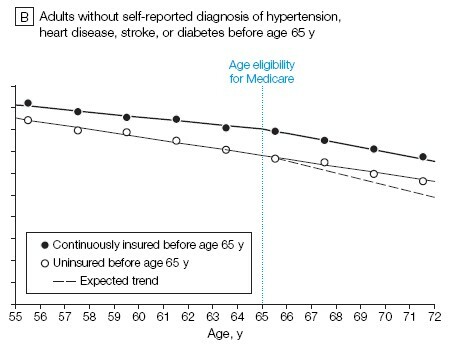 Relative to the insured, those uninsured prior to age 65 visit the doctor more after obtaining Medicare eligibility. From the same paper (), here are the results on hospital admissions. This shouldn’t surprise anyone. It makes sense. It’s hard to get affordable insurance as you approach age 65. If you’re lucky enough to have insurance, then you’re getting the care you need, so getting Medicare is nice, but not a huge change in your life. If you’re uninsured, though, then getting Medicare is a huge change. If you know you need care, and it’s expensive, then you will likely try and wait until the Medicare kicks in to get it. People do this all the time; the evidence above confirms it. Raising the eligibility age will just force these people to wait longer. * If this somehow saved us money, then we suppose you could have a debate about its benefits and harms. Knowing that it will likely cost Medicare more, however, means that it’s entirely possible that delaying Medicare eligibility will cost more and lead to worse outcomes. That’s the worst of both worlds. * McWilliams et al.’s analysis does not take into consideration the effect of health reform. Provided it stays on the books, the non-elderly will have different options in 2014. Still, the analysis shows the value of health insurance, and in particular of universal coverage. McWilliams JM, Meara E, Zaslavsky AM, Ayanian JZ. Health of previously uninsured adults after acquiring Medicare coverage. JAMA. 2007;298:2886-94. McWilliams JM, Meara E, Zaslavsky AM, Ayanian JZ. Use of health services by previously uninsured Medicare beneficiaries. N Engl J Med. 2007;357:143-53. Yes, the evidence does show that many wait until Medicare kicks in to seek care. Lieberman’s idea doesn’t help. That’s exactly what I needed to do. After I retired I could only afford an individual policy with a $15,000 deductible. At age 63 I developed a cataract that made reading difficult and driving at night, in the fog, snow impossible. I waited two years until I turned 65 to have corneal lens implant because the cost of surgery and follow-up cost would have been totally out-of-pocket. What would be the affects if you allowed the age to rise for full-covered access to medicare (maybe phased-in over 10 years), but allow middle aged people to buy into it if they want to? Say those from 55 and older can choose to buy into it if they want as a normal insurance plan (set at comparative market rates) but to get full covered access to medicare you would have to be 67 (say in 10 years) or 70 (say in 25). Part of the problem with medicare is it covers the most sick and least profitable but without adequately offsetting the cost with healthy contributions. If most of heatlhcare costs is for those over 65, then that would bring about 10 years of payments from healthy contributers, offsetting costs, and maintaining and increasing access for those in need of Medicare. It would also get near seniors into the system, flattening that bulge, and treating diseases earlier, when it’s cheaper, and reducing costs in the long run. That might correspond with why wealthy people have a higher life expectancy since they better access to healthcare, treating diseases earlier, and thus increasing life expectancy. By getting near-seniors into the system earlier, then that gap can be reduced, and in the future a slightly higher age for full-payed for coverage in Medicare would not be so burdensome. McWilliams JM, Meara E, Zaslavsky AM, Ayanian JZ’s research is wonderful, but I want more. It would be very interesting to compare Medicare spending by people who had cadillac insurance vs normal vs stingy. I think that for this one might need to get permission from participants to get information from their employers or something as who remembers what deductible they used to pay ? Notably in the ultra classic RAND study a statistically significantly greater fraction of participants in the subgroups with deductibles dropped compared to participants with full insurance. Notably, the dropouts had lower utilization rates before dropping out (this is specific for the two sub experiments on deductibles for ambulatory care and on deductibles for hospital care). Sure looks as if they planned to drop out, kept collecting the fixed fee for participation as long as they could hold out, then dropped out to get care (with their outside of the experiment health insurance). So the cost savings in the RAND experiment are clearly partly cost delays. I see no other explanation of the pattern. Is there a point where people consider medicare too distant to wait? It seems to me that there needs to be a longer and more complete data series to determine if pushing the age back would make people less likely to wait for medicare to kick in. A) The study has chosen to use two illnesses that many people do not discover until they reach the medical facilities. B) The hypertension and diabetes are tend to be higher in the lower economical, minority, males, and many people who do not utilize the physicians’ office for every little problem that occur. C) These two diseases are preventable if detect earlier in the individual. D) The studies do not show the first onset and/or duration the patient had the diseases prior to Medicare. E) The studies does not show those who were chronic verse to acute (new to the) diseases. F) The studies does not show who are being treated verses not being treated. G) The studies are being bias …1. Every time an older person goes into a hospital without medications. He or She will have prescribed medications prior to discharge as maintenance dosages and sometimes do not need it. 2. How many people were follow in this study? In the group, these people are to the hospital. 3. Was this study longitudinal, short- term and how was it set up? This is not a solid study. Everyone would know that many people would understand that factors contribute to your decisions of seeing a physician. In our economy today, it is Money and Jobs and no one (unless you are rich and working in the white house) is going to waste money. Many people do not trust the medical professionals because of the many unnecessary tests, deciding who lives and dies, and bias of those who have insurance and certain people will receive better care over another. The chances is higher not attending a medical facility and reading several resources to get one’s disease under control or taking a flight to another country to receive meds at cheaper cost than walking into critics who writes incomplete articles about health who wants keep the money in their pocket. Do you know money cannot buy time anymore unless you are rich, works in the white house…do not grow old, and you will never face the problems you are creating?